In addition to the impact of corrosion on the performance and reliability of power cycle components such as feedwater heaters and condensers, release of corrosion products from such components and their deposition in turbines and steam generating equipment frequently has led to losses of power generating capability at fossil and nuclear power plants. Since grab sampling and analysis approaches generally will not yield accurate concentration data because of the nature of the corrosion product transport process, application of integrating sampling techniques is mandatory if corrosion product transport and deposition rates are to be quantified (NP-5056-SR). Based on NWT Corporation's extensive knowledge and experience relative to corrosion and corrosion product transport in power generating cycles, several integrating sampler designs have been developed for such applications. NWT offers single channel corrosion product samplers with or without a sample cooler. Both samplers include bypass flow capability. This configuration provides the ability to process a sample from any point in the cycle while maintaining a high sample line Reynolds number via the bypass system. A 0.45 µm filter is generally used to collect filterable species from a continuous sample flow with a cation ion exchange membrane inserted below the filter to collect soluble cationic species and possibly colloidal species passing through the 0.45 µm filter. 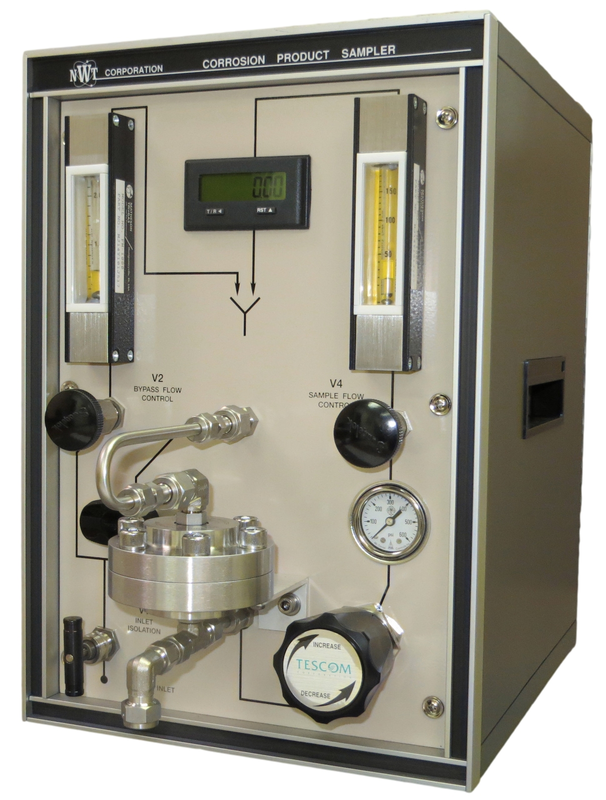 With a sample flow of 100 ml/min for 24 hours, the membrane packet accumulates the impurities present in a 144-liter sample. Pressure regulation is provided to maintain a constant sample flow as the pressure drop across the membranes increases with time. The flow totalizer furnishes an accurate value for the total sample volume. High bypass flow capability (up to 2.2 liters/min.). Pressure regulation downstream of the filter holder to maintain constant sample flow. As a result, constant sample flow is assured as the differential pressure across the filter membranes increases with time. Battery powdered digital flow integrator. Samplers provided in cabinets with clearly illustrated flow schematic on panel. Sample inlet conditions: up to 3000 psig and 500°F (110°F on samplers without coolers); higher-pressure and temperature capability available on request. Filter holder connections are Cajon® VCO fittings for easy use and long life. Inlet and outlet connections are located on a rear bulkhead panel. Inlet and outlet connection can be provided in metric or English sizes (1/4" or 6 mm sample connections; 1/2" or 12 mm cooling water connections). All fittings and valves are Swagelok® family components. When a sampler is supplied with cooling capability, the cooler is mounted inside the cabinet and connected with stainless steel tubing to 1/2" Swagelok® bulkhead fittings on a rear panel ready for connection to the cooling water supply. NWT samplers do not require electrical power. This eliminates the need to install an electrical supply. Bypass flow from a NWT sampler can be easily connected to downstream analyzers. A high temperature, high-pressure inlet isolation valve is provided on the panel. No other isolation valves are needed. This conforms to recommended corrosion product sampling practice, e.g. minimize the number of valves between the process stream and the filter housing. All valves, regulators and fittings are stainless steel (Type 316). All tubing is seamless SA-213 Type 304 stainless steel. Filter inlet isolation is accomplished with a 1/4 turn Swagelok® SK Series ball valve. All standard NWT samplers are mounted in painted steel cabinets with side handholds. Approximate cabinet size and weight for the 100 Series models are as follows: 10-7/8” W x 15-3/4” H x 14-1/2” D (28 cm W x 40 cm H x 37 cm D); 51 lbs (23 kg) with cooler; 35 lbs (16 kg) without cooler. Delivery can generally be made 10 weeks after receipt of order. Please call or email for pricing details. Develop customized corrosion product sampling programs to achieve client goals. Identify major sources of corrosion products. Assess impact of chemistry on corrosion product transport, i.e., changes in pH, oxygen and pH control additives. Evaluate corrosion product transport data and provide recommendations on cost effective approaches to reduce corrosion and corrosion product transport. Perform corrosion product sample analyses and data reduction. The NWT laboratory is licensed to handle radioactive materials. “PWR Secondary Water Chemistry Guidelines,” EPRI, March 1987 (NP-5056-SR). Sawochka, S.G., Copley, S.E. and Pearl, W.L., “Corrosion Product Transport in PWR Secondary Systems,” EPRI, February 1987 (NP-2149). Hook, T.A., Pearl, W.L. and Sawochka, S.G., “Corrosion Product Transport in a Cycling Fossil Plant,” EPRI, February 1987 (CS-5033). Kassen, W.R., et al., “Application of High Temperature Electromagnetic Filtration for Secondary Cycle Corrosion Product Transport Control in Pressurized Water Reactors,” Proc. Intl. Water Conf., 46 , pp. 467-486, 1985. Sawochka, S.G., et al., “Effects of Alternate pH Control Additives on PWR Secondary Cycle Chemistry,” EPRI February 1988 (NP-5594). For more information, please contact Matt Leonard by E-mail or by phone, (408) 281-1100.